In this blog I am going to talk about what The Earth Faeries have been up too – my high lights and the challenges too and how I have overcome them. I am also going to show you some of the places that have inspired me and also any new skills that I have learned on the way. I have been going through a re-brand over the past couple of months and have made all of my products vegan. I thought I’d share with you some of the new materials I have sourced out so you can see what my products are made of and tell you about a new product I am working on that I am excited to finish so I can reveal it to you. My highlights have been that my venture has started to become more visible and has attracted more new customers that I am very grateful for. There is something wonderful about seeing your products traveling around the world and putting smiles on peoples faces. My groups is growing organically and I am making some very helpful connections. I am still learning about the changes to face book and Instagram algorithms as it affects all online businesses. If you are a business owner I know that this will resonate with you. It is also important to keep abreast of the field to ensure our businesses continue to get seen and grow. Otherwise we are offering a great disservice to our customers as they are never going to get to experience our lovely creations. I have also finally learned how to take a picture that you can see now and no more glare from my blue tinge backgrounds. However it is all still a work in progress but each day I am learning more. I am looking forward to using my new camera as at the moment I have been using my camera on my phone and pictures can become blurred if taking the pictures too close up to my products. Plus pictures on mobile phones can look beautiful whilst on there but once made bigger they become very pix-elated. I want them to look as beautiful for you all as possible so I am going to keep on practicing and will be able to get better results with my new camera. I got rid of the white backgrounds and replaced them with a wooden one as firstly it fitted in more with my brand and secondly no matter what I tried I couldn’t get rid of that blue tinge. I have used my wooden window ledges in my new photographs and the light in the bedrooms at a certain time is perfect for doing photo shoots so no hanging out of my windows anymore. This year I wanted to learn how to style my products. I think not only does it make them look more appealing but it adds interest to the pictures. Plus it’s where my passion lies and I am always on the hunt in my garden, house and shops for props that I can use. Here are some of my new product pictures of my hand made personalized roses that I styled. I made these two for my dinner table and I wanted it to look like a wood land theme. Close your eyes for a moment and imagine yourself sat in a woodland with a long wooden table full of beautiful wooden cutlery, twigs and flowers for decorations. Faeries joining you for dinner and squirrels watching with interest from the nearby branches. This vision is what helped me to style my products. A hand made rose table decoration with a choice of having your own words in the scroll or a bespoke poem created by me especially for your loved ones. A soft neon purple hand made rose with a poem in a scroll created especially for you! I am always in awe when I look at other makers websites or shops as they have perfected the art of styling. I was always taught if you want to learn something then learn from the people who have already done it. And so I am on a mission! Several online courses later and after studying others who had perfected it I finally did my first product shots that have been styled with props. The wooden cup and cutlery is courtesy of my friend and a family member. The last picture is out of focus slightly so I will be retaking these with my new camera very soon and look forward to seeing the results. I am also having to learn how to style my dolls heads hair so I can show case my hair slides so people can see how they look when they are worn. A friend of mine is a hair dresser and she has showed me some lovely but basic styles so now I have to put it into practice. It is all fun and creative in the Earth Faeries house hold. I came up against some challenges in 2017. 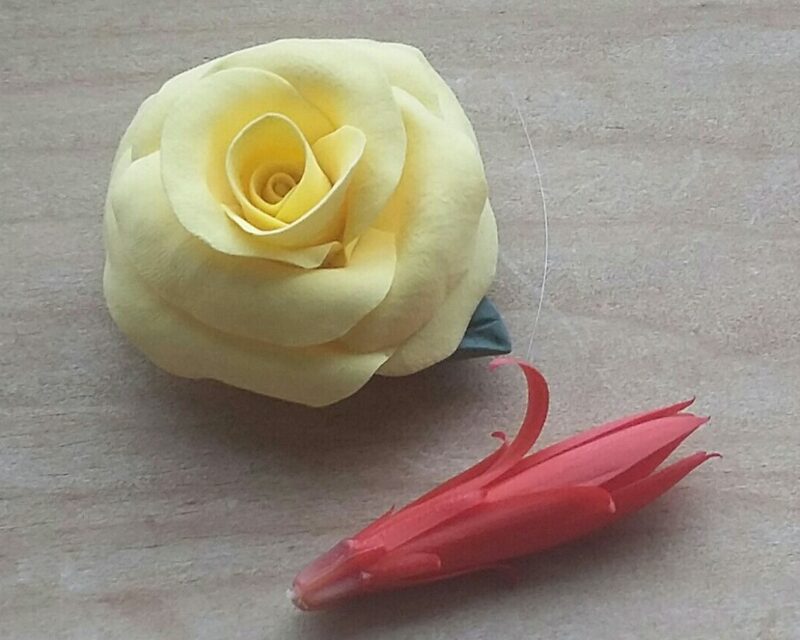 A super glue that I was using wasn’t lasting for long which meant that a couple of months down the line my flowers that I was wearing in my hair were coming off the hair slides. I want to make strong products that last and that are the best on the planet so I knew I had to resolve this straight away. I contacted all of the people who I had sold my hair slides too and only one said it has happened to her too. I thanked her for her honesty and have since made her a replacement and thankfully I still have her as my client. However challenges are there to make us grow and as long as we learn from our feedback and strive for better so we can resolve it then it is always a win win. After lots of trial and error I finally found another vegan glue called gorilla glue that I am now using and seems strong enough to glue a house together. Maybe that is a bit of an exaggeration but you get the idea. I have also taken photography up as my new hobby. I have been photographing landscapes and buildings in the countryside. I was also put in for a black and white 7 day photography challenge that I thoroughly enjoyed and learned lots from it. Making my hair accessories used to be a hobby but once I turned it into a business it became something quite different. Being up to early hours to ensure products are dispatched on time can take its toll so it’s important to get the balance. I counteracted this through taking up my new hobby and I am out in the countryside practicing my photography skills most days. There are so many beautiful places to visit where I live and getting out in nature is a sure way to replenish and change ones mood. Here is some pictures of my travels and some of the places that have inspired me. The Earth faeries are out for a hike in the wilderness in Wales – near Ceiriog forest. This was taken near Ceiriog forest – a beautiful wilderness of different green hues. The ruins of a castle. This place is called Castell Dinas Bran in Llangollen. It means fortress of crows! Castell Dinas Bran in Llangollen – the ruins of a castle on top of hill with the most beautiful views of the countryside, cliffs and bigger hills. The new products I am working on. I am currently working on some new table decorations that can be used as home ornament too. My new project is a tree of life made out of wire work and beads. I am making it for my daughter and her partner but there are plans to make them available to buy on my online shop and website in the near future. I planning on putting the Tree of Life on a pebble or rock because I want to add some of nature to the design. I have just received some of the Swarvoski crystals today that will be using in my new project. They are a lovely emerald colour and I thought that they would look lovely as leaves. Here are some of the things that I have learned last year and this year too that I thought would help you in your business. One of the biggest things I learned last year is either to make things that people want and to make them in the colours that are trending. Rather than what I like. Yes, it was a big learning curve. I have been researching the colour trends for spring and I must admit I do love all of the pretty colours that are going to be in for the Spring. Lavender pinks, navy’s, naturals, yellows, mint to name but a few are all going to be working our way into our wardrobes. However I have found that there are customers who don’t buy because of the trends and they wear the colours that they love and reflect their individual personalities. One of the things I love about the clays that I use I can create most colours with them. I mix them so if someone can’t find a colour they like in my shop or on my website I can mix them to get their preferred shade or colour. So you still get to be uniquely you and I get to have even more fun as it is one of my most favorite parts of making my products. You can see some of the spring collection on my online shop. Please click here. I also learned that if something isn’t working to do something different. That way you get different results. But no matter what the outcome there is always something to learn from it and as long we learn from it, and strive for better then its always a win win! Keep up to-date with changes in your industry. The internet is constantly changing all of the time and marketing strategies have to change to keep abreast of the field. Marketing that worked six months ago may not work now since the algorithms have changed so keeping update in this area is crucial if small and big businesses are to go forward. Once your hobby becomes a business it is time to get a new hobby to keep the balance. Get the best pictures of your products that you can. I am still learning and have a long way to go. That’s the beauty of life though. There is no such thing as perfection but we can strive to be best that we can be. And most importantly as one very successful online shop owner told me don’t get so caught up with trying to reach perfection with your pictures. This can prevent you from getting your products out there. Or you may be waiting for ever. Just do the best that you can and keep practicing. We all have to start some where and as your business grows you can always outsource. If your phone camera pictures look pixelated once the pictures are made larger (like mine) then it is time to invest in more up to date model or buy a camera. There are some very good quality cameras out there that don’t run into hundreds or thousands which is great news if you are on a small budget. What two most important things in regards to business did you learn last year? Lovely pictures. Where you live looks gorgeous and dramatic. I need a camera… Nice tip about finding a new hobby! Makes me laugh! Thank you Doreen for taking the time to read my blog. I’m delighted you like the pictures. Yes it is a lovely place to live and I do feel grateful to live here. I love the countryside. Things are always different as the landscape is always changing so lots of different things to photograph each day. It is nice to find another passion. Haha thank you. I am glad that you liked that part and it made you laugh. I am still using my Camera phone as I am still learning how to use my camera so by the time you get a new camera I will probably still be learning how to use this one haha. Peace and love! Keep up the learning!